If hybridization was the cornerstone of the Green revolution of the 60s & 70s, some would like to see GMOs (Genetically Modified Organisms) as the trigger for the next agricultural revolution. This paper will argue that it is far from it. It is true that humans have been tinkering with crops for thousands of years. Evidence of selective breeding can be found in Asia dating back to 7800 BCE. About the same time, in the Andes, the natives transformed a noxious plant into Potatoes, the 4th most important crop for humans today. The top 3 (Rice, Wheat and Corn) all came from wild inedible grasses through massive human intervention through the ages. The same process of selective breeding also spawned seedless grapes and watermelons, the fat heads of broccoli and virtually every fruit & vegetable we consume. These are inspiring stories of evolution. So far so good. But a discontinuous change happened in 1992. Using a newly acquired DNA technology, the Flavr Savr Tomato became the first genetically engineered vegetable. An inhibitor added to its DNA made it firmer with a longer shelf life. With this, the floodgates opened for GMOs. Most will however argue the GMO tomato is not a flavr savr. In fact it's the flavor thief. 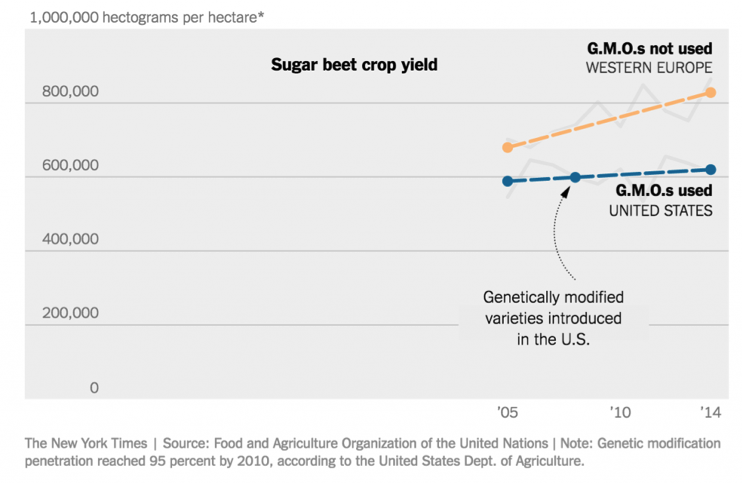 But loss of flavor is only part of the larger problem with GMOs. 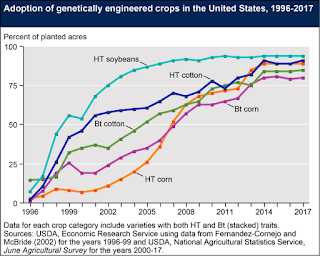 In 1995 we saw corn, a staple ingredient in processed foods in the US, genetically engineered to produce their own pesticides by using genes from the B.thuringiensis bacteria. By 1996, we saw a host of herbicide resistant crop seeds, allowing for entire fields to be sprayed with weed killing chemicals without damaging the crops. All of this being done under the FDA's (GRAS) Generally Recognized as Safe standard, rather than the more stringent Federal Food, Drug, and Cosmetic Act (FFDCA) for food additive tolerance requirements. In the short 25 years since its creation, we have seen the proliferation of GMOs across the US farmland and in supermarkets. Genetically modified seeds account for 81% of the corn and 94% of the soybeans grown in the US, while in a typical grocery store 70% of what Americans find on shelves are made from ingredients that have been genetically modified! 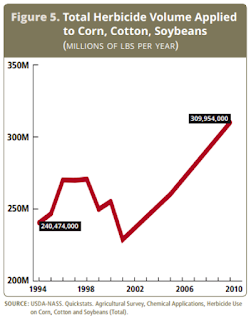 The US is the largest consumer of GMOs in the world. So it may be instructive to draw some lessons from there before countries outline their own policy towards genetic modification of food. 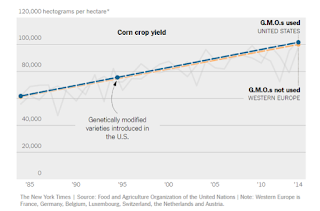 A bunch of arguments are made to promote benefits of GMO seeds. Main among them are higher yields, resistance to certain herbicides, and improved nutrition. For farmers looking for a way to increase their profitability, switching to GMOs seemed like a silver bullet. But only a few short years into what was hailed as the "next revolution in food" the GMO movement is facing serious headwinds both from within the industry and from a larger consumer movement. 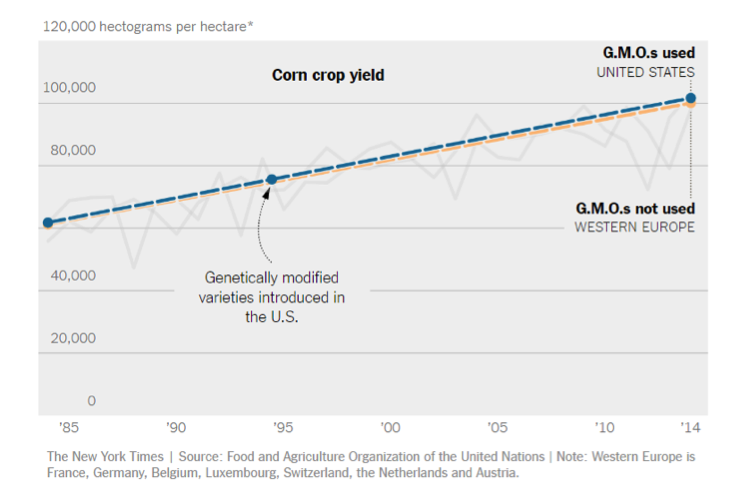 After over 20 years of use, no scientific study conclusively supports GMO use as increasing crop yields. 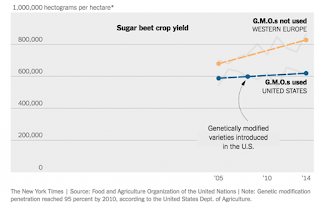 Europe, which has resisted the GMO movement, continues to match US corn and sugar beet yields using non-GMO seeds and less herbicides and pesticides! The promise of Increased yields of GMO crops was a carrot to many farmers who struggled with the high costs of running a farm. Is their life better today? 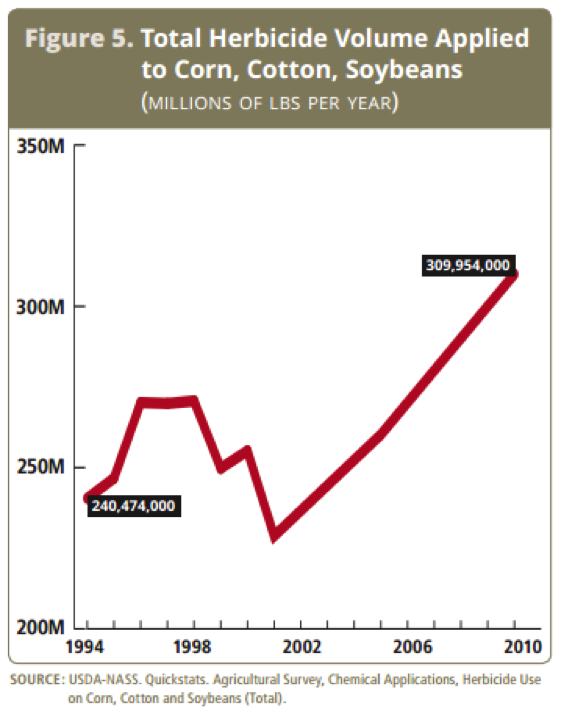 After 25 years of GMO existence the brutal fact is that apart from the colossal Federal farm subsidy of $25 Billion last year; over 20% of American farmers are on the national food assistance program (SNAP), earlier known as food stamps! In theory, planting herbicide resistant seeds allows for a heavy spraying of a weedkiller at the beginning of the season but less spraying during the course of the growing year, reducing overall consumption. Unfortunately, the theory only held for a few years following the introduction of GMOs. Chemical resistant Superweeds are starting to appear on GMO farms across the US. Resistant to one or more types of weedkillers, superweeds are forcing farmers to increase and vary the chemicals used in a single growing season or worse, reverting back to heavy tilling to remove weeds which erodes topsoil. The increased use of herbicides further raises concern of runoff water laden with toxins entering the water supply. A picture above is worth a 1000 words. 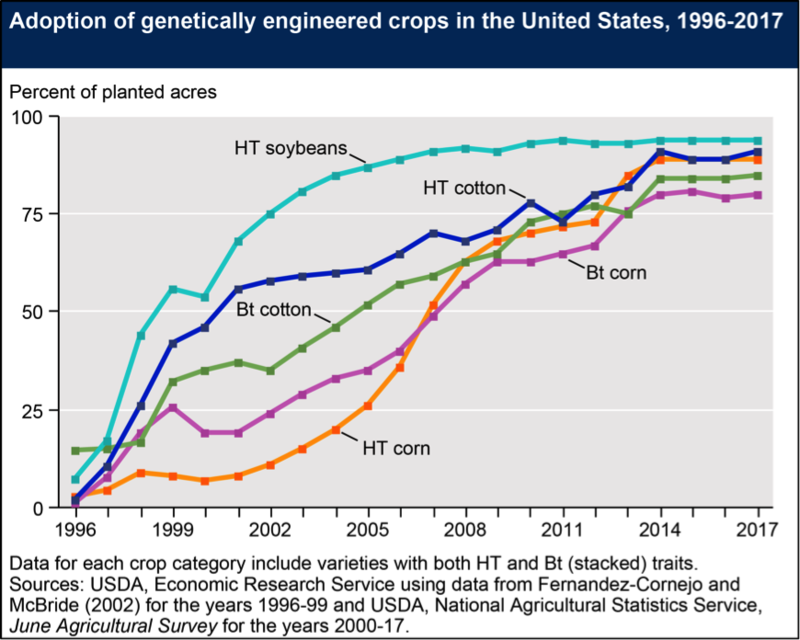 So much for reduced herbicides since the introduction of GMOs about 25 years ago. When weeds become resistant to herbicides, new GMOs must be formulated to be resistant to additional toxic chemicals. More R&D costs equal higher seed prices. Farmers who habitually use GMO seeds become addicted to purchasing the newly reformulated seeds and their corresponding reformulated herbicides in a never ending vicious cycle. The first attempt to increase the nutritional value of the food we consume by genetic modification was the Golden Rice project. Promoted as a way to prevent childhood blindness caused by a deficiency in Vitamin A, a gene from corn and (animal) bacterium was embedded in a rice variety that helps produce beta carotene, a precursor to Vitamin A in the human body. Field trials of the rice never never reached the affordability and yields required to make it commercially viable. In addition, the original premise that a Vitamin A deficiency alone caused blindness was flawed as it was later proven that a combination of dehydration and malnutrition in children prevented the absorption of Vitamin A causing the blindness. Golden Rice was fighting a symptom, not the cause. No comprehensive studies have been done to check the phytochemical dilution in vegetables as they get genetically modified. Without external fortification it is today virtually impossible to genetically create desirable phytochemicals, micronutrients and alkaloids within a vegetable and have them bio-available to humans. No, GMOs have not enhanced human nutrition. American consumers are becoming more wary of what ingredients are in their food and are calling for mandatory GMO labeling by food manufacturers. While several food and agrochemical companies are fighting this, it seems almost inevitable that more descriptive labeling is on the way and with that, the debate will almost certainly escalate. Supermarkets are already demanding non GMO labels. Regulators are scrambling to keep pace. The foundation for a ban on GMO imports into the US and other developed markets (or at any rate increased trade barriers) is an all too realistic scenario. It appears that the next green wave of food production is at a crossroads in the US, but the manufacturers of GMOs are not waiting to see which direction the American consumer takes. They are aggressively marketing to European and Asian countries, using the same promises they made to American farmers. They question is - will history repeat. The march of science is unstoppable and genetics is no exception. Science allows us to dream big. But the pursuit of a big dream demands careful callibration and the study of unintended consequences. Our future prosperity lies in our intelligent application of science and not in the mindless pursuit of what can be done as opposed to what ought to be done. Acknowledgement: Deep debt of gratitude to Bob Wells ( Program Coordinator at The MAV Foundation, www.mavfoundation.org) for researching and providing me the early draft for this piece. Am hoping the Government ( of India) listens, sees the sense this well researched and argued piece is making!